CDC | If you think legalizing marijuana won't affect you... Think Again. Heroin use is part of a larger substance abuse problem. Nearly all people who used heroin also used at least 1 other drug. Most used at least 3 other drugs. Heroin is a highly addictive opioid drug with a high risk of overdose and death for users. Alcohol are 2 times more likely to become addicted to heroin. 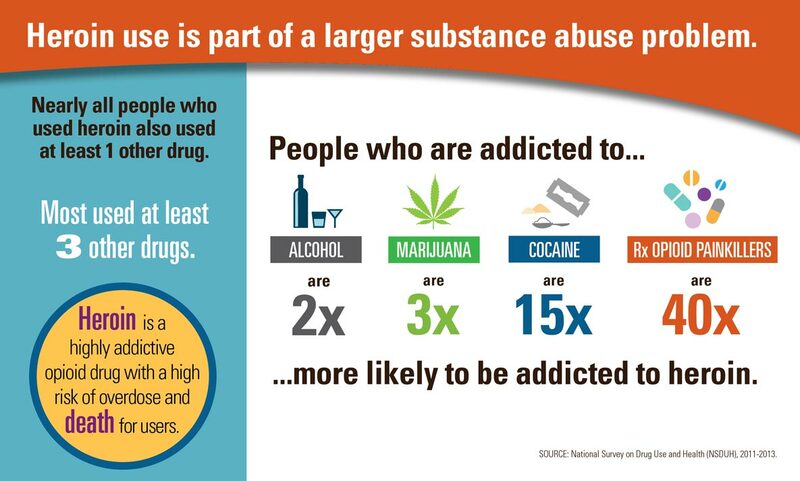 Marijuana are 3 times more likely to become addicted to heroin. Cocaine are 15 times more likely to become addicted to heroin.. Prescription opioid painkillers are 40 times more likely to become addicted to heroin. SOURCE: National Survey on Drug Use and Health (NSDUH), 2011-2013.